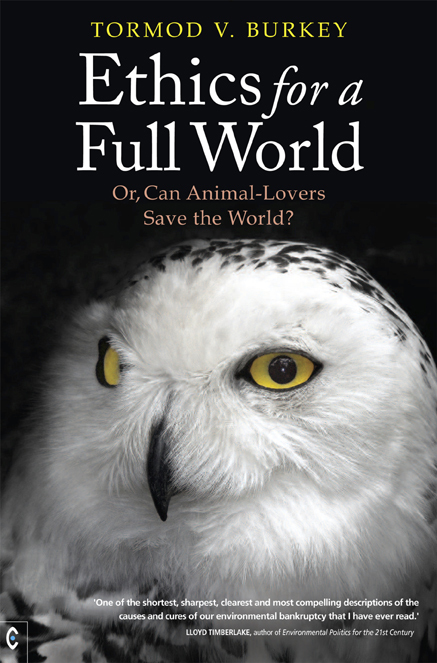 or, Can Animal-Lovers Save the World? The global emergencies facing the inhabitants of our planet – climate change, biodiversity meltdown, ocean acidification, overfishing, land degradation and more – are symptoms of a common problem: the world is full. Humanity has already exceeded several planetary boundaries. The situation is without precedent and its manifestations are numerous. Ethics for a Full World argues that our dominant culture’s anthropocentrism – our human-focused thinking – is an underlying cause of the world’s problems, threatening life as we know it. The blights that endanger our planet are experienced by many today, particularly those who care about other species, as deeply personal tragedies. So why are we not acting to save the world? Some say that humans won’t do anything until we feel the repercussions ourselves – but by then it would be too late. This book takes an uncompromising view on our culture, our democracy and us as human beings, and examines why it is so difficult to save the world from ourselves. In a globalized world, the most urgent issues are the ones that exhibit tipping points, as they are the ones that it may become too late to fix. Burkey argues that non-anthropocentric ethics and the people who hold them, could be key to turning the tide. In a cry for meaningful and effective engagement, he proposes a concrete first step to connect concerned individuals. This is a book for people who want to be part of the solution, and who aren’t fooled by the feeble attempts for change that have been made so far. Tormod loves animals with a vengeance, and longs to experience wildlife untrammeled by habitat degradation and persecution. He has struggled since childhood with the difficulties of saving endangered species, the natural world and the beautiful places on earth from human beings’ ignorance and greed. He lives in a cabin on the banks of the river Glomma, Norway, with ‘his’ cat Kitty, and writes for a diversity of publications and media outlets.